EXCLUSIVELY AT NEIMAN MARCUS Linen duvet with contrast velvet accent tape. Zip closure and corner ties inside to hold filler. Includes two matching shams. Back: cotton. Dry clean. Duvet: 106" x 96". Made in the USA of imported materials. European sham with embroidered scallops. 350-thread-count white cotton percale. Optional 3-initial circle-script monogram. Machine wash. Made in the USA of imported materials. Personalized/monogrammed orders cannot be canceled or returned. The monogram preview feature displays fabric color (not pattern), thread color, monogram style, and selected initials. Twin flat sheet with embroidered scallops. 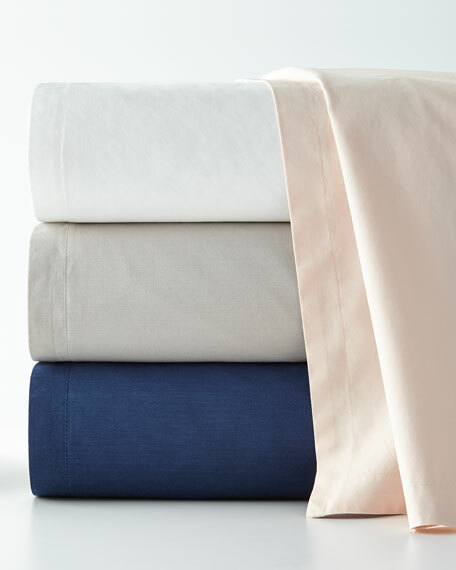 350-thread-count white cotton percale. Optional 3-initial circle-script monogram. Machine wash. Made in the USA of imported materials. Personalized/monogrammed orders cannot be canceled or returned. The monogram preview feature displays fabric color (not pattern), thread color, monogram style, and selected initials. Pair of king pillowcases with embroidered scallops. 350-thread-count white cotton percale. Optional 3-initial circle-script monogram. Machine wash. Made in the USA of imported materials. Personalized/monogrammed orders cannot be canceled or returned. The monogram preview feature displays fabric color (not pattern), thread color, monogram style, and selected initials.